This is the true story of two organizations that have recently undergone significant change. Economics forced them to re-examine their key business processes and staff allocations in order to continue to survive and hopefully grow. One organization succeeded with their change journey while the other did not. The reason for success and failure was not due to the process they used, but rather how the organization carried out the process and demonstrated commitment to the initiative. My reason for sharing these stories is to help others improve their chances for successful change management; by avoiding the pitfalls and short cuts that lead to failure. I have assigned special names to each organization to maintain confidentiality. I will refer to them as Organization Opportunity and Organization Challenge. It’s not what you do, but how you do it that can make all the difference in the outcome of an initiative. A Strategic Change Initiative requires leadership’s dedication, patience and firm resolve to ensure success. While both organizations in my story used the same steps to achieve change, their levels of resolve and commitment to seeing it through differed, and this ultimately changed the outcome. The Steering Committee oversees the entire journey of change. This committee should ideally consist of a mix of management and staff level employees and are an on-going committee, although members may change from time to time; between every 6 months to one year. The committee makes recommendations, develops implementation strategies, implements these approved strategies and communicates to all employees throughout the change journey. One of the first tasks for any Steering Committee is to provide employees with a forum to “vent” their experiences with past changes and what to give them an opportunity to identify what is necessary to make this change happen successfully. This is the creative part of the Strategic Change Management Process. The Steering Committee creates their vision of what the future will look like, once the entire change process has been successfully implemented and the new culture is apparent. The Change Strategies close the gap between the present and the “ideal future” as defined in the vision. Essentially, the change strategies move the vision of what the organization is trying to become in the employee’s and customer’s eyes, into reality. The Change Plan includes identifying the objectives required to meet each of the Change Strategies and the detailed action plan required to meet each identified objective. It must include performance success measures to ensure that it is clear when each change strategy and related objective has been met. Organization Opportunity called a meeting, early one morning, for all employees. This type of “town hall” meeting had never been done before. The employees were curious and somewhat nervous. Posters saying, “Project X,” were mounted on the large conference room’s walls. A large cake was brought into the room with “Project X” written across it. When the 400 employees walked into the large conference room, coffee was served to them. Once the President finished his speech, he called on me to come up and introduce the process that was to be undertaken for the change. There was a mood of excitement mixed with uncertainty amongst the employees, which is a normal response. Organization Challenge took a different route to start their journey; they hoped to fast track the process. The CEO of this 250 person organization decided to hold an all-day “town hall” meeting and use this meeting to rapidly go through some of the first steps in the process for Strategic Change Management with all the employees. The intent was to gain early and quick buy-in to the change. Employees were organized at round tables of 10 people per table. Each table had one member of the management team assigned as a facilitator. As the consultant, I had already spent time with the management team, prior to the event, to provide an overview of what we would be doing in the course of this day, and how each person could help to facilitate their “teams” through the steps, as well as ensuring that everything would be documented. 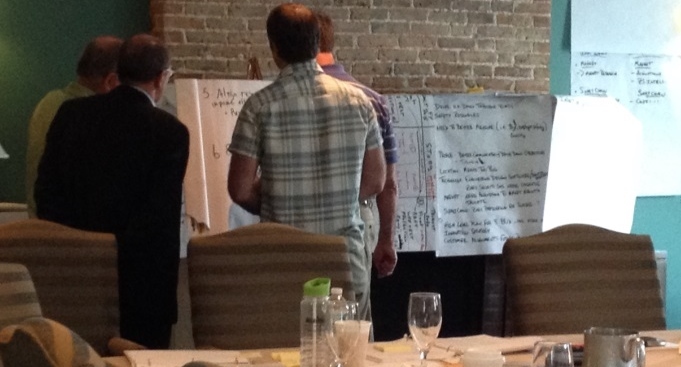 Organization Challenge used a combination of steps in the strategic change management process at their all-day meeting. Their mandate was to take from the all-day employee meeting: the organizational change readiness outcomes, strategic change visions and change strategies, as the basis for the development of their final plan. They also identified their Steering Committee members at the conclusion of their all-day Change Event Meeting. Organization Opportunity pre-determined the composition of their Steering Committee. They identified eight individuals for their Steering Committee; comprised of management team members and selected individuals from various departments. Although these committee members were pre-determined, employees were informed that there would be opportunities for many of them to be involved in the implementation of the change strategies, once developed, and that these details would be included in their first employee communication. The new Steering Committee collected all of the ideas for a name for this change initiative and agreed on the name, “Evolution” for their organization’s journey of change. As their first order of business, they awarded the employee with the winning name a gift basket for their effort. Organization Challenge decided on the composition of their Steering Committee members at the conclusion of their all-day Change Event Meeting. One of the first tasks for any Steering Committee is to encourage employee engagement. This is accomplished by bringing staff together in small focus groups where they are in a safe environment to either “vent” or talk about the organization’s past and current situation. These sessions are carefully organized so as to allow employees, working in their focus group teams, to respond to structured questions regarding how they have felt about organizational changes in the past and how they are feeling about it in the present. Such sessions require a skilled facilitator to lead them; to help move discussions from the negative to the positive. The positive is achieved by ending each session with the question, “What is necessary to ensure this change is managed successfully?” This gives employees a sense of control over their future. Another way to determine readiness for change is by undertaking an “Organizational Change Assessment.” This on-line employee survey collects data from employees about how they want the change to be managed. It is used to determine perceived obstacles to change. This type of assessment provides the Steering Committee with a heads up on employee attitudes and provides valuable insight as well as a baseline for planning. Organization Opportunity held focus groups throughout the organization with up to 15 individuals in each group. Approximately one-quarter (25%) of all employees participated. As their consultant for this project, I facilitated the focus groups to ensure that employees felt that they had an environment of openness to share their true feelings. The outcome of this approach was similar to the success seen in the Organization Challenge sessions. The process of employee engagement helped both organizations move their staff into a sense of control and engagement. Of course there was some scepticism. “We’ve done this before.” “They never listen to us.” “What’s the point”, etc. This placed a huge burden on the organizations to honour this past and to recognize the need to engage employees throughout their change processes, using ideas from their employees, on how to make it happen successfully. In addition to focus groups, Organization Opportunity also conducted an Organizational Change Assessment with employees to ensure that all employees had an opportunity to provide feedback on how they wanted this change to be managed. Employees overwhelmingly embraced this opportunity for their input with almost 90% of them completing the assessment. This result is well above all averages for employee feedback surveys and clearly demonstrates that employees want to be consulted when it comes to organizational change as it is highly relevant to them. Between the focus group inputs and change survey assessment, the Steering Committee had a lot of great information to help them develop their vision and strategies for the change initiative. What they liked about the change. This is the creative part of the Strategic Change Management Process in which the Steering Committee creates their vision of what the future will look like, once the entire change process has been successfully implemented and the new culture is apparent. Organization Opportunity and Organization Challenge both used a similar process for creating their change vision. I facilitated a session in which I took them into the future and asked them to develop a story describing their organization, its employees, customers, structure, etc. as it would look 5 years from now, once the change had been fully integrated into the organization. Organization Opportunity created their story during a Steering Committee meeting. It gave them a sense of control over their future. For Organization Challenge, these scenarios were created in each team during their all- day session. They read them out to each other. Applause broke out at the end of each presentation. It was an incredible event to see. Both organizations found that reviewing the results of their readiness for change data helped them to develop these scenarios. Organization Opportunity reviewed the outcome from the employee focus groups and change assessments, while Organization Challenge reviewed their focus group data for inspiration. The purpose of developing change strategies is to close the performance gap between what is the current status of the organization and its “ideal future” as defined in the vision. Organization Opportunity’s Steering Committee identified 7 key strategies. They started the development of their communication plan but wanted to wait until they gave some thought to a high level change plan before delivering it. Organization Challenge had spent almost a day together in their meeting. Before leaving, I had the teams identify the key events they believed were necessary, in order to get closer to their future scenarios and to align with what they believe is necessary to make change happen successfully (from their first team discussions). They were clear and surprisingly similar between the teams. This provided wonderful direction to the Steering Committee. Both organizations were successful in reaching this point in the Strategic Change Process. The Steering Committee’s first meeting took two days to combine all of the information from the day long employee session. When they ended, they had a clear vision and change strategies for their initiative. They started to create their communication plan to present to all employees. Creating the Change Plan includes identifying the objectives required to meet each of the Change Strategies and the detailed action plan required to meet each identified objective. It must include performance success measures to ensure that it is clear when each change strategy and related objective has been met. Organization Opportunity moved into high gear at this stage. They developed a communication plan and organized another “town hall” meeting to present it to all employees. At this meeting they reviewed their change strategies and their plan to implement these. It required assistance from all employees. They posted sheets at the back of the room with the change strategies and a request for volunteers for each one. Each strategy would be headed by a member of the steering committee to oversee each change strategy team. They had an overwhelming response. Teams were formed for communication, culture, training, business process reviews, etc. The steering committee promised, through the communication team, to produce regular newsletters updating all employees of the progress towards each change strategy. Within 6 months the effects of the change in Organization Opportunity could be felt. The culture had been re-shaped, key business processes improved, the organizational structure revamped including reporting relationships. Productivity increased, morale increased and customer satisfaction levels increased. You can walk into the organization and “feel” the difference. For Organization Challenge the outcome was different. The Steering Committee developed a comprehensive communication plan. They were going to ask for volunteers to help create committees to implement the actions required to ensure each change strategy was successfully implemented. They presented their plan to the CEO for approval. Unfortunately, the corporation promoted the CEO the next day and moved him to another division. This created a delay in the communication plan’s delivery. When a new CEO started 4 weeks later, I desperately tried to connect with her. However, the new CEO had no buy-in to the Strategic Change Initiative and so aborted the effort. The Steering Committee appealed to her to allow them to proceed, at least with smaller steps, but in the end the initiative died and the change plan was never implemented. As a result, the staff became disillusioned and the organization fell into a depressed state that was even worse than prior to the initiative’s beginning. This will now become one of their descriptions of an unsuccessful change. The learning here is that any Strategic Change Initiative requires a long term commitment from leadership. If management bails out of their commitment to the initiative for any reason, whatsoever, the impact is devastating for employees of the organization. In the case of Organization Challenge, the new CEO’s actions sent out a clear message that the organization did not honour their commitments to the employees. This created a downward spiral in employee confidence, which ultimately hurt the company’s bottom line and took them backwards rather than forward. Managing change is a risk. Status quo is always safer. And leadership at the very highest levels of the organization must be committed to the initiative’s successful implementation. Starting a change event and following the strategic change management process can deliver remarkable success in a relatively short span of time, as was experienced by Organization Opportunity. But starting the process is the same as opening Pandora’s Box. Once opened, you cannot close it. The consequences, both positive and negative, will last a long time.